The canister, encapsulates the vitrified HLW which is organised in arrays of cladding tubes to diffuse heat effectively. A cast iron insert protects the canister from mechanical stress and an outer copper envelope prevents corrosion. The buffer, made of bentonite, a clay-based material which surrounds the canister. The buffer swells in the presence of water to provide a mechanical support pressure onto the walls of the deposition hole, allowing the excavation to withstand the in-situ and thermal stress. 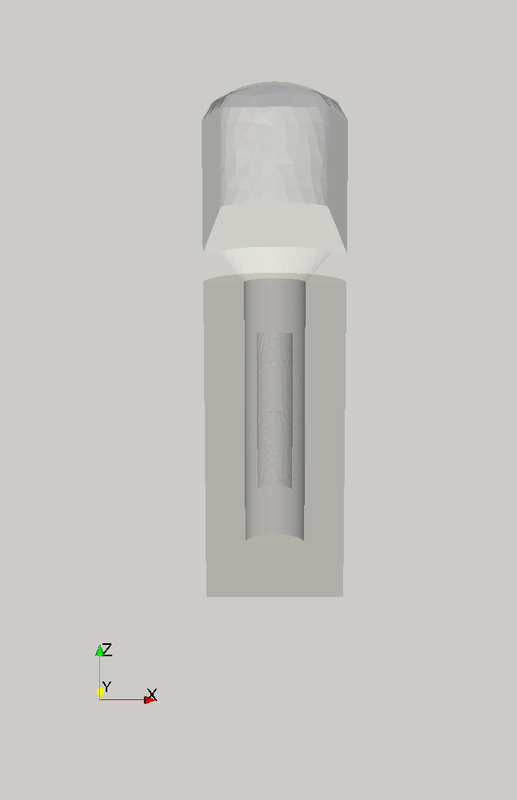 The role of the buffer is to delay any eventual radionuclide release from the canister. The host rock. The surrounding rock formation prevents radionuclide release upwards into the biosphere and also provides a stable chemical and mechanical environment for the engineered barrier. Hence the rock formation must be of low permeability as well as seismically inactive. The three-barrier system (SKB, 2000). The term “coupled processes” means that processes are interdependent and that a change occurring in one of them impacts directly and indirectly the others. 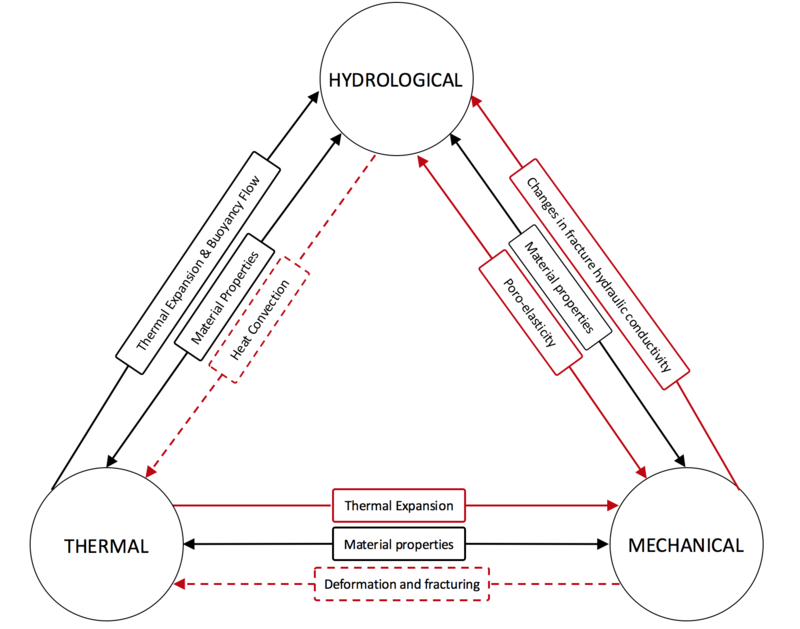 Thermo-Hydro- Mechanical and Chemical coupled processes (THMC) are acknowledged by the international waste management community to have a significant long-term impact on the three-barrier system and are widely recognized to be of critical importance on post-closure safety of GDFs (Geological Disposal Facility). Thermo-hydro-mechanical coupled processes chart (Joulin, 2019). 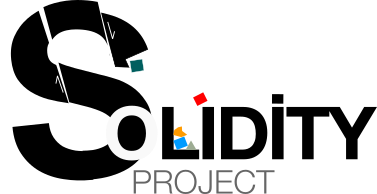 Three-dimensional modelling: using all three dimensions allows to model the multi-barrier system with all its degrees of freedom. 3-D also provides insight into the extent of fracturing induced by heating and the associated changes in hydraulic properties. Multiphase flow: the consideration of gaseous and liquid phases flowing in the rock mass and buffer is mandatory for the assessment of the THM state of the multi-barrier system. Heterogeneity modelling: rock masses have complex and non-uniform properties that may differ by orders of magnitude. If such heterogeneities are known, it is important that they are taken into account in the modelling input. Multi-material modelling: to capture the THM behaviour of the multi-barrier system, all materials, i.e. 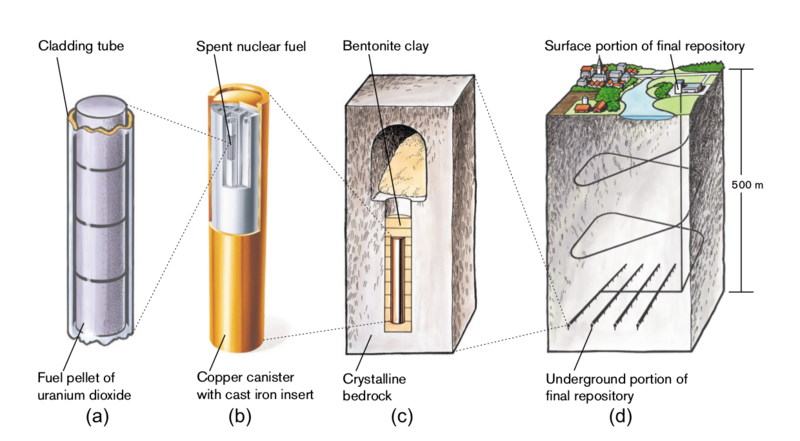 canister, buffer and host rock must be represented. Each of them having their own THM properties and boundary conditions. Implicit solvers: such solving methods produce results with no time step restriction, they are said to be unconditionally stable. They are indispensable for post-closure simulations as the time scales at play are relatively large (hundred and up to thousands of years). Discontinuity modelling: Single fractures and fracture networks present in the rock mass are one of the most influential features to affect safety. They have a considerable impact on the stress response of the rock mass, on the potential of radionuclides transport. Fluidity (IC-FERST), the fluid solver models the hydraulic processes with a continuum approach while Solidity employs a continuum approach for the modelling of the fractured rock mass and a discontinuum for the fracturing process. The thermal processes can be handled in both Fluidity and Solidity. The fluid and the solid mesh are super-imposed and communicate information on the coupled processes at specific time intervals via a mesh-to-mesh interpolation scheme (see fluid-solid coupling). 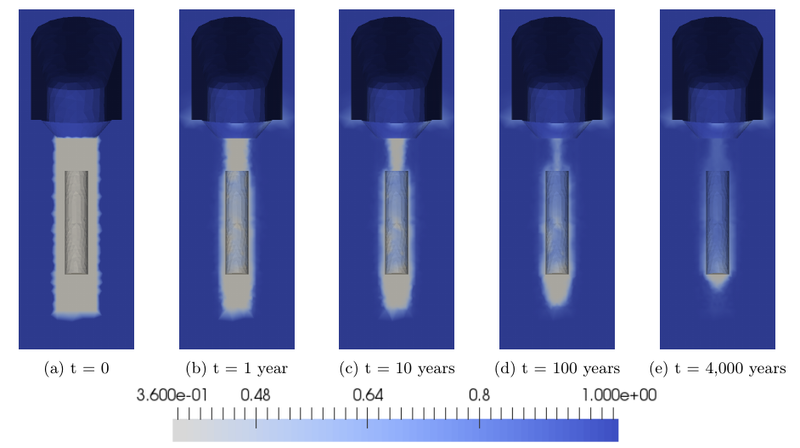 The Fluidity-Solidity architecture benefits from a mature computational fluid dynamics technology for flow in porous and fractured media on one side and from a geo-mechanical tool widely applied to fracturing problems on the other side.